My boss invited all of us to her 40th birthday party back on July 12th. I had been curious to see their house since they moved here, since it was such a shock to my boss. She was used to living only a few minutes from civilization and now they had a house on 10 acres of land, truly in the middle of nowhere. They had a ton of food, all of it pretty healthy because my boss eats that way as well. There were 4 different types of salad, one of them such a vibrant green color and so pretty that I had to ask what it was. I found out it was a kale salad. It was delicious! Everyone was raving about it so much, that Tom, the resident hater of all things green and vegetable-like, even tried and it declared it not bad. So of course, I asked for the recipe. When we had the going away party for Calvin, I knew I wanted to make this salad, not only because it was different, but because I really wanted some more of it! 1. Rinse and dry kale. Cut away all stems. 2. 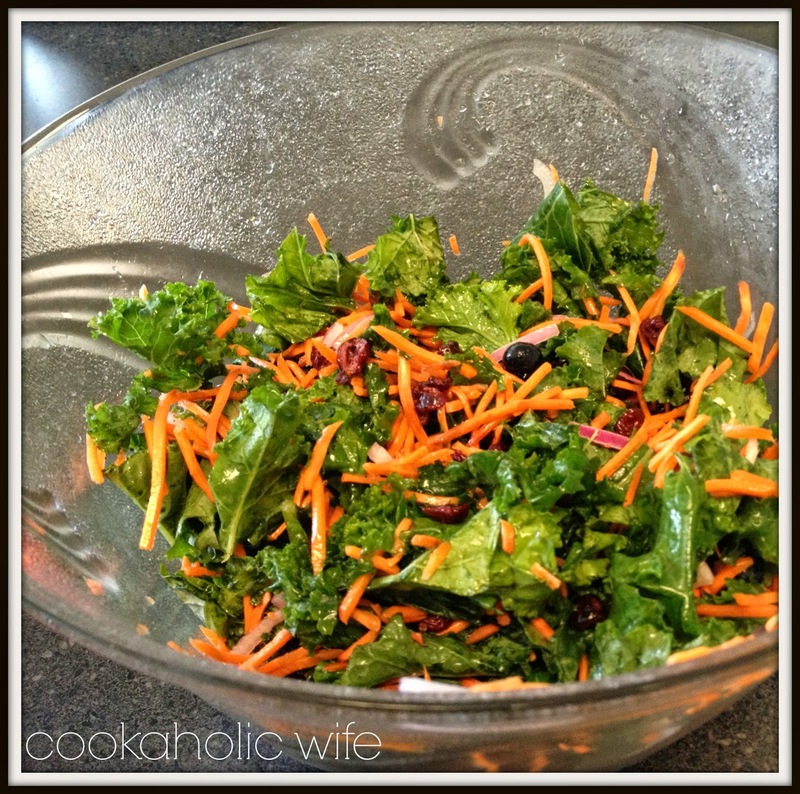 In a large salad bowl, toss kale with carrot, blueberries, Craisins, red onion and sunflower seeds. 3. Whisk together vinaigrette ingredients until the sugar has dissolved. Pour half over the salad and toss to coat. 4. 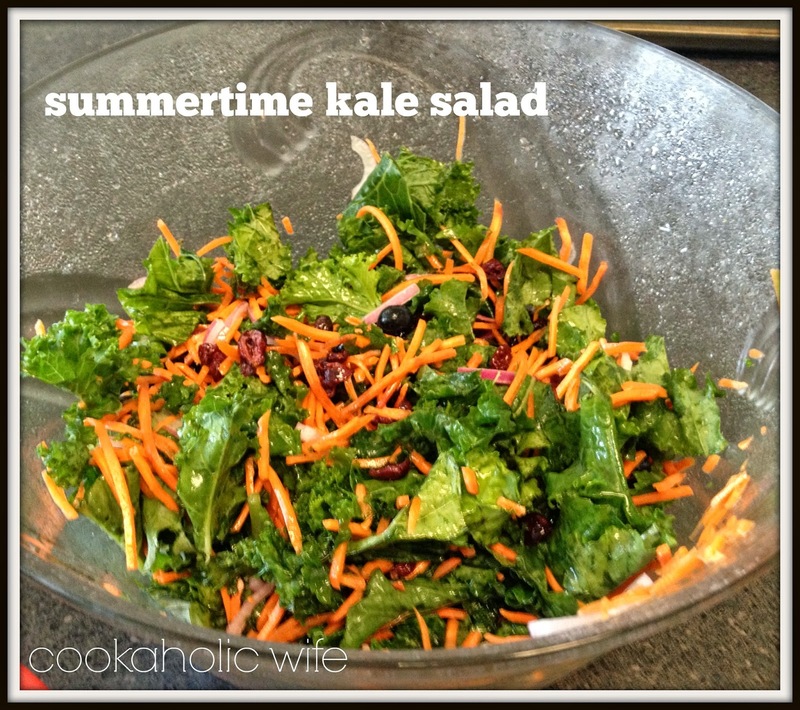 Refrigerate salad for 4-6 hours or overnight if the kale is really hearty. 5. Serve, with remaining dressing on the side. This is so easy to whip up! Everyone who tried it liked it and I took the leftovers for lunch the next day. My packaged kale was nearing the end of its bagged life and didn’t hold up to the dressing nearly as well as a fresher variety would. I should have only went the 4-6 hours instead of overnight.